« Indian Falcon Hunters Become Fervent Conservationists. Sea eagle found dead on Mull following treatment for a broken wing & leg; was the release on Mull the correct thing to do? 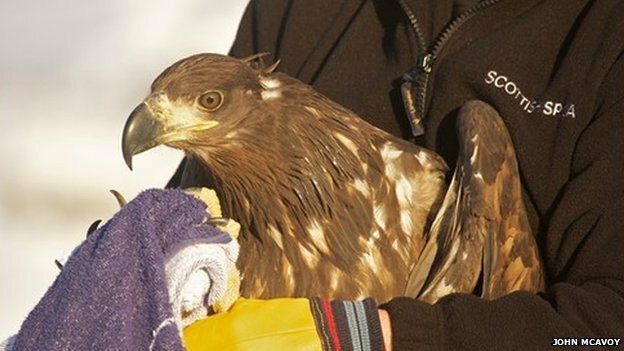 A sub adult White-tailed eagle has been found dead on the Isle of Mull after being treated and then released on the island after sustaining a broken wing and leg. The body of the four-year-old male, known as Kellan, was discovered by a hillwalker over the festive period. Kellan was rescued by RSPB Scotland in 2010 after breaking his wing and leg. He was nursed back to health by the Scottish SPCA and returned to the wild. Kellan, the white-tailed eagle, survived for four years after a dramatic rescue, which involved the RSPB, the Scottish SPCA, one of the world’s leading wildlife vets and local landowners, who supplied him with deer carcasses to help him build up his strength. RSPB Mull Officer Dave Sexton, who followed him every step of the way, said he was “heartbroken” to have had to go and gather his remains after they were spotted by a hillwalker. It is not known how the bird died but it is thought he may have been involved in a fight with an adult sea eagle. Kellan was hatched at a nest on the island – known to millions of Springwatch viewers as Eagle Island – in 2010. He took his first flight during the summer but within a few weeks was found on the ground, badly injured. “He was defiant and a fighter and he deserved his second chance back in the wild, where he belonged” said Mr Sexton. “I last saw him alive in 2013 and immediately knew it was him as he had quite a distinctive flight profile with his once broken wing held at a slightly different angle. Mr Sexton said Kellan was well on his way to being a full breeding adult with white tail feathers and a pale head and beak, and this may have been a factor in his death. “He was found close to another active sea eagle nest and as a near adult male he wouldn’t have been welcomed by the resident male and there may have been a fight over the territory,” the RSPB officer said. “He was a gutsy young eagle with his full, long life ahead of him and I wouldn’t be at all surprised if he went into battle as he was at that kind of age. Mr Sexton said his “heart sank” when he heard Kellan’s remains had been found and knew his dream of “finding him one day paired up with a female and breeding himself was over”. “But he had four good years in the wild, living life as an eagle should and that’s what matters most,” he added. 1 comment to Sea eagle found dead on Mull following treatment for a broken wing & leg; was the release on Mull the correct thing to do? Should have flown to the Solway to join the other bird from Mull! !